Travel Writers are always quizzed about destination, which hotel, airline, activity,restaurant do you recommend! But the most asked question is; which is your favourite city? Since first being introduced to Quebec City 25 years ago that has been my answer. 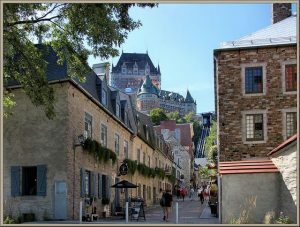 On a recent trip my thoughts were overwhelmingly re-affirmed with the vista of The Chateau Frontenac, the mighty St Lawrence River, the Plains of Abraham and the nooks and crannies in the old city featuring artists and shopping. It is the capital city of the province and was founded in 1608. The city has 635,000 residents and the St Lawrence River snakes for 1197 km from the Great Lakes to the eastern seaboard. From the riverside, take a stroll up Petit Champlain, one of the areas bursting with boutique shops, musicians, artists and atmosphere. If not feeling so energetic get the Funicular which takes you up the steep incline to the old town. A little out of town is the Canyon Sainte-Anne, this is spectacular and make sure you try the Zip Line. 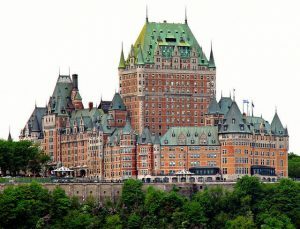 This is one of the most beautiful attractions in the Quebec region. The trail passes through three bridges, providing great scenes of the waterfall, the canyon and the trees. www.canyonsa.qc.ca It is situated close to the famous Montmorency Falls and nearby (approx. 35 minutes from the city) is the stunning Sainte Anne de Beaupre Basilica. It has a reputation for miracle healing. The huge array of medical wares like crutches hang for all to see at the back of this massive church. Continue on this road out of Quebec City and take another hour or so to the Charlevoix region. This includes parts of the north shore of the Saint Lawrence River and the Laurentian Mountains region of the Canadian Shield. This dramatic landscape includes rolling terrain, fjords, headlands and bays; the region was designated a World Biosphere Reserve by UNESCO in 1989. Visit my number one destination in the world and you won’t be disappointed.